"Have we reached the point where we now must seriously consider trading off the personal mobility and economic prosperity enabled by automobile transportation to mitigate its negative side effects? Or, can we take advantage of converging 21st century technologies and fresh design approaches to diminish those side effects sufficiently while preserving and enhancing our freedom to move about and interact? This book concludes the latter." The authors include William J. Mitchell, Professor of Architecture, and Media Arts and Sciences at the Massachusetts Institute of Technology directs the Smart Cities research group at the MIT Media Lab, Christopher Boroni-Bird, Director of Advance technology Vehicle Concepts at General Motors and Lawrence D. Burns, who consults on transportation, energy and communications systems and technology. The book is published by the MIT Press. The authors start with getting the urban economics right. They recognize that the "freedom and prosperity benefits" of the automobile "have been substantial." They note that the automobile industry "set the stage for the growth of the middle class," something that has been labeled the "democratization of prosperity." The authors say that the car "enabled modern suburbia" and "powered a century of economic prosperity." This refreshing treatment is consistent with the overwhelming economic evidence that links personal mobility with prosperity, such as by Remy Prud'homme and Chang-Wong Lee, David Hartgen and M. Gregory Fields and others. It is also at considerable odds with the widely accepted, somewhat nostalgic planning orthodoxy that rejects private automotive transport as “unsustainable”, unaesthetic and anti-social. This ideology embraces the illusion that forcing people to travel longer, with less personal flexibility somehow will improve the economy and raise the standard of living. The authors envision a automobile characterized by a new "DNA." It starts with smaller cars, fueled by electricity and hydrogen (fuel cell technology). It also begins with an understanding that the cars used in many mundane urban operations today – for example getting to the market or pick up the kids at school – are over-engineered. They are far larger than is needed for most trips, their capacity for speed exceeds urban requirements and their range between refueling is also more than needed. The authors would re-engineer urban vehicle to the needs of metropolitan dwellers, an "ultra-small vehicle" (USV). The designs proposed include far lighter cars that can be easily "folded" up to minimize parking space requirements. Cars would be connected to one another by wireless technology, all but eliminating the possibility of collisions. The cars would be small enough that they could be assigned special dedicated lanes on current freeways and streets. Travel would be less congested because the dedicated lanes would have a far higher vehicle capacity, while the interconnectedness would allow cars to safely operate closer to one another. The combination of electricity, hydrogen, wireless technology and the USV would bring additional benefits. This would permit improved vehicle routing, as drivers would be advised take alternate less congested routes. This would also, in time, lead to self-drive cars, about which Randal O'Toole has recently written, made possible by the use of wireless technology and that dedicated lanes would make possible. Car sharing is an important part of this future, for dwellers of dense urban cores, according to Reinventing the Automobile. The author's note that car sharing can solve the "first mile-last mile" problem making it possible for transit users to speed up their trips by not having to walk long distances to and from transit stops. Indeed, car sharing programs are set to be adopted in urban cores with some of the world's best transit systems, such as Paris, and London. Privately operated car sharing systems have been established in a number of US metropolitan areas, such as Atlanta, Denver and San Francisco. These developments and the Reinventing the Automobile vision show that it is unnecessary to tell people in America (or Europe or the developiung world) that they must give up their automobiles. That is good news. The social engineering approaches requiring people to move from the suburbs to dense urban cores and travel by slower, less frequent transit are incapable of achieving serious environmental gains (see below) and can not seriously be considered progress or desirable by most people in advanced countries. This is illustrated by recent developments in automobile technology and research (Figure). Before the adoption of the new 2020 and 2016 new car fuel economy standards, the US light vehicle fleet was on track to increase its greenhouse gas (GHG) emissions nearly 50% from 2005 to 2030 (the green dotted line in the figure). 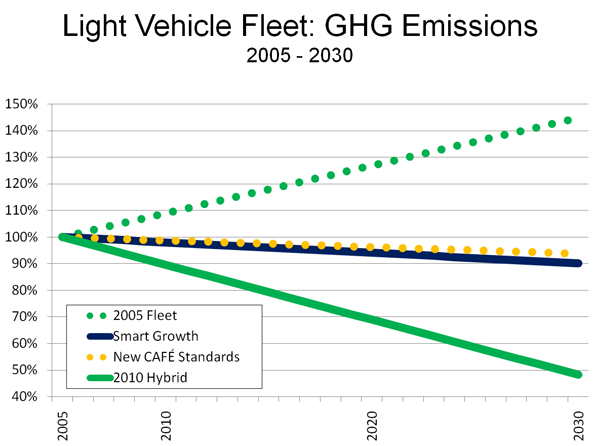 As a result of the new fuel economy standards, Department of Energy projections indicate that greenhouse gas emissions from light vehicles will be one-third less by 2030 compared to the 2005 fleet (the yellow dotted line), and this is at the standard projected driving increase rates that could well be high. The smart growth strategies of land rationing, densification and discouraging driving would produce, at best, a marginal reduction in GHG emissions, using the mid-point of the recent proponent research (Moving Cooler), indicated by the solid blue line. Actually, this overstates the impact of smart growth, since it discounts the substantial GHG emissions gains that result from higher fuel consumption in more congested traffic produced by densification. The potential for technological advance is illustrated by the green solid line, which estimates the GHG emissions from light vehicles in 2030 if the average fuel economy were equal to today's best hybrid technology. Overall auto-centered technology-based strategies – such as the improved fuel economy standards and the hybrid fuel economy – would each produce about 15 times as much benefit as the smart growth strategies proposed by such studies as Moving Cooler. This approach would not only be far more productive in terms of environmental improvement but would not require interfering with people's lives in ways that would require longer trips times, less convenience, seriously retarded job access and, inevitably, fewer jobs and lower levels of economic growth. It would be a mistake – and likely political folly – to force a re-engineering our way of life in order to enact strategies with dubious environmental benefits. In the final analysis, personal mobility must be retained and expanded, because there is no alternative that is acceptable to people, whatever system of government they happen to live under. Reinventing the Automobile paints the most optimistic picture to date and, if given due serious treatment, could prove a debate changer. Submitted by zion1122 on Wed, 08/21/2013 - 10:37. Submitted by midtown on Fri, 07/09/2010 - 17:48. Mr. Cox, I would say this is your best article, at least that I've come across. An ultra-small car makes a lot of sense although in many U.S. suburbs, there are so many gigantic SUVs that safety will always be a concern. I REALLY liked that Volkswagen test model. Thanks for bringing the book to our attention. Such small cars might actually help smart growth. For example, these types of vehicles would make cycling more palatable just due to the smaller size -- i.e., they aren't as intimidating as a Ford Expedition with a driver who might be drinking coffee, looking at a text, and is so insulated that he/she can't even see a cyclist until it's too late. Also, if such ultra-small cars were to become popular, they could also reduce the massive parking lots necessary in car-dependent areas, which would result in a more walkable/cyclable environment. I would make one comment about smart growth: as I see it smart growth is rarely about limiting choices, with the possible exception of an urban growth boundary. More often, it is about expanding choice to being able to walk or cycle to destinations, meeting friends and neighbors more easily, and generally having a more interesting city or town. 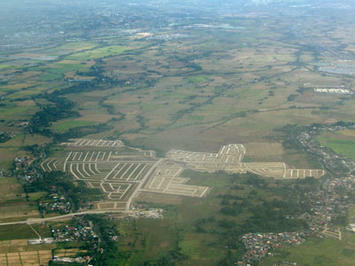 Smart growth allows more options in the form of relaxed zoning and building use. So, in my opinion your attacks on smart growth are unfounded in large part. Submitted by tx1234 on Fri, 07/09/2010 - 10:54. The automobile doesn't necessarily need to be drastically changed beyond conventional design nor require people to alter their use of vehicles in general. As we speak carmakers are gradually coming out with cars that meet the future need of alternative energy, but doing so in baby steps. The transformation has been occurring for almost 2 decades thus far. 1: The introduction of computerized emission and fuel controls for vehicles led to better economy. 2: The Prius and other hybrids hit the market over 10 years ago and have been a success. 3: The Chevy Volt is the next stage, having a 40 mile all-electric range with a conventional engine backup, thus enabling people to still have the range while cutting fuel use by more than 50% over even existing hybrids. 4: All-electric vehicles with limited 75-100 mile ranges are also hitting the road next year. 5: Tesla has their all-electric model S coming out in 2012. If successful, Americans can continue driving as they have- in both metro and suburban areas- as they always have. This is the march of progress. Submitted by rcarey96 on Fri, 07/09/2010 - 09:31. How can you be so snide about the supposed "social engineering" of public transit and what I imagine you mean to be things like growth boundaries and zoning, while at the same time laud what would clearly be just another kind of "social engineering" in the creation and maintenance of ultra small vehicles and the further expansion of suburban areas? History is a notoriously poor guide for prophecy, but what in the history of car consumption (or contemporary car culture) suggests that Americans would be willing to purchase ultra small vehicles? They strike at the heart of Americans' understanding of personal freedom and mobility. Will this too not require some social engineering? Additionally, your love of suburbia leads you to avoid discussion of any of its possible problems. Indeed, you simply ignore them with a sentence: "It is also at considerable odds with the widely accepted, somewhat nostalgic planning orthodoxy that rejects private automotive transport as 'unsustainable', unaesthetic and anti-social." The vision of America as an ever expanding suburban paradise is as old and nostalgic or more so, than this supposed "nostalgic planning orthodoxy," and for good reason. The poverty (cultural, social, and increasingly economic) of the suburbs is not a nostalgic fantasy and will worsen if engineered to expand. Be honest, the landscape of the United States is already the product of social engineering, just one that has encouraged the growth of single-family detached dwellings and the instantiation of the ideology of the liberal individual into the material and social life of the United States. You're optimism about that history and your prophecies for the future are charming, but at odds with a past and present realities.